Sitting in the waiting room of a hospital can create tremendous anxiety especially if the person waiting has cancer. The Massachusetts General Hospital Cancer Center has found a way to elevate a patient’s mood and shift the focus from the illness to something more comforting and inspirational. It’s Illuminations, the center’s rotating art exhibit now in its 16th year. When patients enter any of the approximately 13 waiting rooms at the Mass General Cancer Center on the main Boston campus or at the Danvers, Waltham and Concord satellites, they see a variety of works by New England artists displayed on the walls. “Our art exhibit is intended to provide enrichment and inspiration separate from the cancer journey,” says Megan Carleton, an art therapist and Illuminations Program Manager. To exhibit, artists must submit an application and send in images of the artwork. A committee comprised of current and former Mass General Cancer Center patients, doctors, nurses, other hospital personnel and art lovers from the community reviews the application. Even though a piece may be great art, it might not be a good fit for Illuminations. “We try to keep it uplifting and engaging something that would help a patient keep their mind off their treatment,” Carleton says, “or would make them want to get up out of their chair and take a closer look or even engage in conversation with the patient sitting next to them.” One example featured an exhibit of dog portraits, and people began sharing their own stories of the dogs in their lives. The artwork rotates every four months to maintain the vitality of the program and to keep people engaged. In any given rotation, there may be as many as 165 works of art by perhaps 20 artists displayed. The number fluctuates depending on the size of the pieces and the configurations. The exhibit mostly consists of paintings and photographs, but it has also included silk scarves, quilts, mixed media and encaustic (hot wax) paintings. Most of the works are for sale, and often people will purchase a piece to celebrate the end of treatment. Although the program does not push sales, they provide an artist’s statement along with contact information for interested buyers. 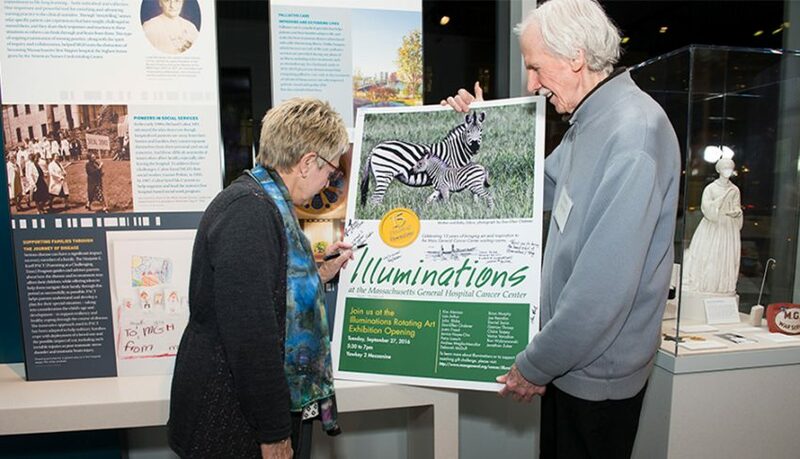 Illuminations celebrated its 15th anniversary in November with an event at the Paul S. Russell MD Museum of Medical History and Innovation, where it introduced a new video and a new program: Illuminations Live. One of the local artists, Jonathan Zuker from Rockport, has become the artist in residence. His father was treated for cancer at Mass General 13 years ago, and Zuker discovered that painting was a great outlet for him. He comes to the Mass General Cancer Center on Wednesdays and paints in the hallways. People can just sit and watch him, but most tend to walk by and talk to him about what he’s painting. “Many people feel stressed or anxious, and to be able to sit down and watch a painting come to life helps to reduce that anxiety and create that sense of awe,” Carleton says. In addition to Illuminations and Illuminations Live, Carleton says that the center is piloting another residency that adds some technology to the program. Justin Freed, who does mostly nature videos, is the digital artist in residence. Some of his videos have been exhibited in the Support and Education Hub. “We have plans to try to make the digital artwork more accessible to people, so maybe they could pull it up on their own device and experience the soothing benefits of watching that nature video while they’re waiting for their appointment,” Carleton says.